The 9th annual Responsible Investments Association of Australasia (RIAA) Conference, was a sell-out event, at the Hilton, in Auckland, on September 18. Attendees included the who’s who of Responsible Investment (RI) fund managers and other large players from the finance and sustainability industries. A formal Iwi welcome opened the day, and was followed by 11 sessions, each presenting a multitude of subject matter experts. Despite the short breaks for coffee and lunch we (finappster) still managed to mingle with key industry players to gauge their thoughts on the current state of RI in New Zealand, what ‘nirvana’ looked like to them, and possible ways of getting there. Learnings from the conference and discussions with attendees are outlined below. While this article mentions a number of differing investment strategies, fund managers and funds, this is not an endorsement of this investment style, or any particular name mentioned. This article is in no way is meant to be taken as financial advice. If you’re considering making a responsible investment we advise that you find a financial advisor who can help you invest in a way best suited to your personal situation. norms-based screening – screens investments by using minimum standards of business practice defined by international bodies such as the United Nations >> signatories to these international bodies (such as Mint Asset Management and Westpac's fund manager BT Funds - signatories to the United Nation’s Principals for Responsible Investing) will be governed by these principles when making investment decisions. Sustainability-themed investments – focuses on investment in themes or assets specifically related to sustainability factors. This commonly refers to funds that invest in clean energy, green technology, sustainable agriculture and forestry, green property, or water technology. >> This is akin to Pathfinder Asset Management’s funds – two (the Global Responsibility Fund and the Global Water Fund) of which have been RI certified by the RIAA. Impact and community investing - includes financing that is provided to businesses with a clear social purpose. Impact investing is aimed at solving social or environmental problems whilst also delivering financial returns. This includes community investing, where capital is specifically directed to traditionally underserved individuals or communities. >> The Impact Investors Network provides Impact Investing to social enterprises in the Hawkes Bay to the benefit of that region. Corporate advocacy and shareholder action - employs shareholder power to influence corporate behaviour. This might include direct corporate engagement (i.e. communicating with senior management and / or boards of companies), filing or co-filing shareholder proposals and proxy voting that is guided by comprehensive ESG guidelines. >> Devon Funds regularly engage with CEOs, CFOs, senior management and Boards of Directors to gain insights into the company’s governance structure and their approach to ESG issues or address concerns. Integration of ESG factors - involves the systematic and explicit inclusion of environmental, social and governance factors in traditional financial analysis and investment decision making. >> Rutherford Rede provides an RI portfolio which utilises a dynamic ESG approach that values companies based on their ESG policies. Who’s more likely to support responsible investing? 56.00% believe that as well as financial analysis, investment schemes should also consider ESG factors such as environmental damage, climate emissions, human rights, corruption and diversity on company boards >> mostly people who are ‘consciously environmentally friendly’, and who have other financial investments. The majority of us are still relatively new to the concept of investing, being inducted with the KiwiSaver Scheme. Now 11 years old and with our balances growing, many of us are becoming more aware of our KiwiSaver Scheme retirement savings as an investment. To understand how our investor mentality might be shaped in coming years we can head across the ditch to Australia, where their compulsory Super scheme recently marked its 25th birthday. Deloitte released their ASX Australian Investor Study 2017  which found 60.00% (11.20m) of Australian adults held investments outside of their Super fund. 37.00% (6.91m) of the Australian adult population held on-exchange investments. From a high of 53.00% in 2005, the current figure is still significantly higher than the 16.00% from the early 1990’s when compulsory Super was introduced. So, we can anticipate that as we become more familiar with our KiwiSaver Scheme investment, we will also consider alternative investment options. Mr Neal, of Rise Financial, is one of only two accredited RIAA certified advisers. He, and other RIAA members such as C2C Partners, can tap into the knowledge provided by RIAA. For the rest, immediately, we may again consider looking to our Australian counterparts for some guidance on how to respond to this demand. The outcome of this strategy is provided in a way that New Zealand fund managers are familiar with (risk-based portfolios - like a balanced or growth fund; or asset-based portfolios - like a shares or fixed interest fund). Since the inception of the KiwiSaver Scheme, the Reserve Bank have recorded a 5.98% outflow of invested funds in New Zealand assets into overseas assets. This figure is comparative to the growth of funds invested in overseas listed shares (+6.18%). This single figure should not belie the significance of the amount given the proportion of funds invested listed shares in New Zealand was 23.31% compared to 76.69% overseas at the end of June this year . Delving further, these proportions may be justified given the returns of overseas indices. Including a global financial crisis, a successful bull run and reinvested dividends, between 1 July 2007 and 1 July 2018 an investment in the Nasdaq Composite Index would have seen a return of 195.78%. Similarly the Dow Jones Industrial Average would have returned 153.26% while the return on investment from the New Zealand Stock Exchange (NZX) would have been 115.08% . So while fund managers are increasing the weight of overseas assets within their portfolios, this could be an opportune time to focus the weighting into more responsible industry sectors. “Pet Passion” (includes pet supplies, veterinary care and retail companies). Pathfinder Asset Management (based in Auckland) have started offering themed-portfolios like Motif Investing. Pathfinder's Global Water Fund contains 50 – 100 stocks from companies who earn a significant proportion of revenue from the water industry (such as pipe, pump and irrigation manufacturers) and specialist chemical producers, water utilities, water treatment and technology companies (such as desalination, water metering and specialist engineering companies). KPMG are currently helping companies understand, assess and manage the growing influence of non-financial issues, including environmental performance and social impact, to positively impact the companies financial performance and long-term business value protection and creation. Fund managers could seek to understand these non-financial issues to sustain a different utilisation of companies on the NZX. This and access to more and potentially larger companies in overseas markets might help us better define portfolio themes within industry verticals, and potentially provide more stable returns. This could offset investments with more volatile returns such as those of smaller or early-stage local businesses found on the likes of crowdfunding platforms or the USX. Small businesses (with less than 20 employees) are an integral component of New Zealand's economy. In 2017 this sector accounted for 97.06% of all enterprise and contributed an estimated 27.91% of the total New Zealand Gross Domestic Product. In the year to December 2015 small businesses were responsible for creating 42.00% of all jobs . It seems intuitive to support an integral part of New Zealand’s economy not only by buying their products and services, but also by investing in them. The amount invested in early stage New Zealand businesses, through the angel and private investor community last year, was $86.00m . In addition, in the 12 months to July 2017, $13.00m was invested into early stage businesses via local crowdfunding platforms  and the USX (which launched a trading platform for unlisted shares at the start of this year) completed $39.40m in trading in the 12 months to November 2017 . This represents 46.21% (which is not insignificant) of the $299.48m of employee and voluntary contributions to KiwiSaver Schemes in the year to March 2018 . While the risk factor attached to early stage and small businesses is higher than for those of companies with an established track record of growth, the outward support of early stage and small businesses, taking the time to check out their management capabilities and prospects, may be reflected in the investment return. It is clear, however, that there is demand for our investment dollars to be used like our consumer dollars - to support companies who positively impact our communities and the environment. 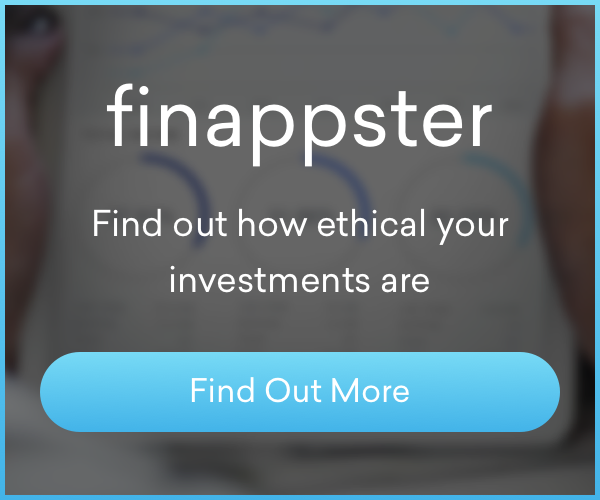 Fund managers with a strong customer-focused orientation, and those supporting the industry, like finappster, seem best placed to attract consideration. Who would you share your slice of pie with? The tax man wants his slice of your pie - especialy if it's juicy with profits made on your cryptocurrency sales. Will you declare your profits? Find out what the numbers in finappster's dashboards include.